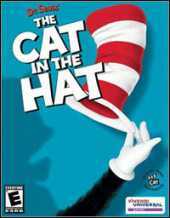 Based on Dr Seuss's Cat in the Hat, the live-action movie version starring Mike Myers, you play as the cheeky cat. There are all the original characters including, Conrad, Sally, and Mr. Quinn who tricked Conrad, and Sally into opening the box the Cat was in, as he was released into the outside world. Although the main characters are real people that have been digitalized, the backgrounds and other objects like enemies and collectibles are all imaginary. The Cat must help Conrad and Sally to return the magic to the box the cat came in, and get all three pieces of the "Crab Lock" in order to lock the box for good. The game allows to the see the rooms that where not included in the movie. Players control the Cat as he moves around the house in a platform style game. The Cat can use his umbrella to glide across ledges. He can glide with it, use it as a shield, pound items by bouncing downwards, and blow bubbles with it. The bubbles are used defensively, and can capture enemy creatures inside for more powerful weapons. Besides collecting the magical circles, which are needed to build up the Cat's magic in order to move from room to room, the Cat will also collect cake pieces for health points, and four keys per room from Thing 1 and Thing 2 (no, I don't know how Things 1 & 2 are suddenly four things holding four keys now), which will open up a bonus level in each room.